Home → Events, News → Undergrads: Eat Pizza and Chat with Librarians! 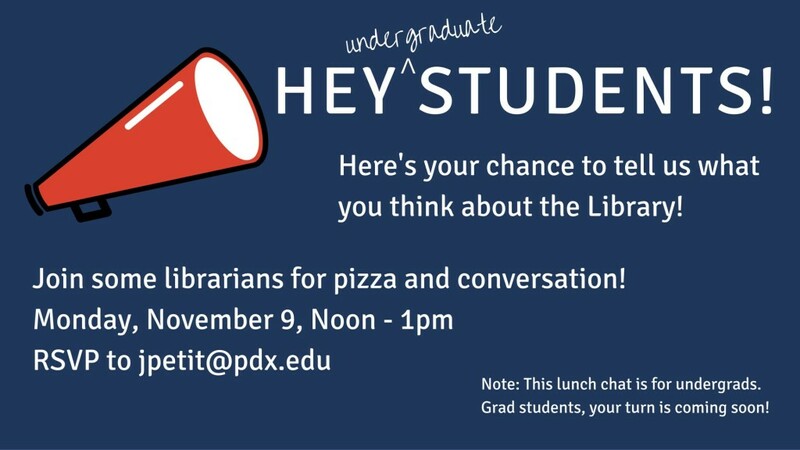 Undergrads: Eat Pizza and Chat with Librarians! Are you an undergraduate student at Portland State? The Library wants to hear from you. How do you use the Library’s spaces and services? What’s working great? What could be better? Over the next several months, we are inviting you to join us for a series of conversations to discuss these very topics. Our first conversation is coming up Monday, November 9 at noon. We’ll have pizza! Joan will get back in touch with you with more information, including the location. Questions? Please contact Joan Petit via email (jpetit@pdx.edu) or phone (503-725-2397). Hope to see you there! Please note: this first conversation is for undergrads. Grad students, stay tuned! We’ll be inviting you to a conversation in winter term.